Why is Fair Trade a women’s issue? And why, furthermore, is it a Jewish women’s issue? While women are routinely mocked for shopping ‘til we drop, there is truth in female shopper stereotypes: we are responsible for 85% of household purchases, even of products used by men. How do we Jewish women use our purchasing power for social good, raising our purchases from the merely material to mitzvah-territory? The fair trade movement marries shopping to social justice, guaranteeing fair, reliable wages, gender equity, healthy working conditions, and environmental stewardship. By spending more to assure that the people who create our products are justly treated and compensated, we are following the edicts of Rambam. This famous scholar ranked tsedakah; buying fair trade is at the top, since it helps the poor escape destitution. When I first explained the concept of fair trade coffee to my son Zach, he pointed out its opposite: “unfair trade”, where workers are squeezed and powerless. This past February, I traveled to Guatemala with 10 other women and two men on Fair Trade Judaica’s annual trip visiting artisans who, remarkably, create beautiful Judaica. In fact, their Judaica lines have been so well received that the craftswomen are expanding them. While many Jews have supported Fair Trade through their individual purchasing, Ilana Schatz created the Fair Trade Judaica movement. On a honeymoon trek to Nepal with her husband, David Lindgren, she shopped for a replacement for her worn-out tallit. She met a weaver whose work she loved and commissioned a new prayer shawl. Ilana Schatz, founder of Fair Trade Judaica. Photo by Betsy Teutsch. 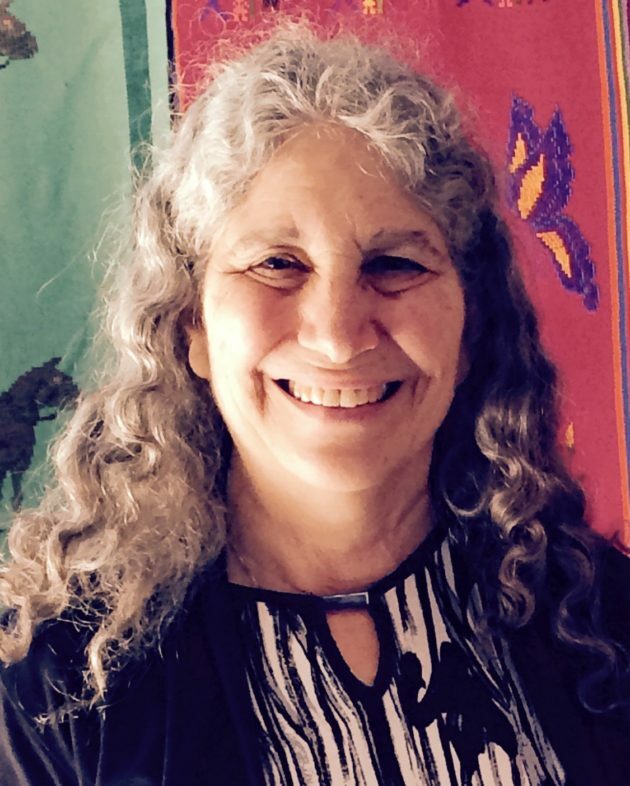 When she put it on back home in Berkeley, Schatz felt suffused by the spiritual connection to her tallit’s creator and the satisfaction of knowing her tallit helped the weaver support herself. Seven years later, Fair Trade Judaica has become a portal for fair trade Jewish ceremonial objects as well as outreach and education in the Jewish community about incorporating fair trade purchasing into our individual and communal practices. That is what brought us to Guatemala, home of rich textile traditions and an abundance of highly skilled female artisans barely able to support themselves. Sheer abundance drives down prices. We met with artisan groups in remote places who, through liaisons, create Judaica. This affords them access to a niche market. Not only were their kippot, tallitot, and other items a treat for the eyes, we were able to see the impact of Fair Trade up close. The women have improved their modest homes. Their children are all in school, with many continuing on to college. Quite a few artisans—surprisingly—were proudly single. We learned that their increased income has allowed them to postpone marrying and be more selective about mates. One weaver, because of her increased income from weaving tallitot, left an abusive marriage. Mayaworks Kippot. Photo by Betsy Teutsch. Mayaworks sells over 7,000 kippot a year—that adds up. 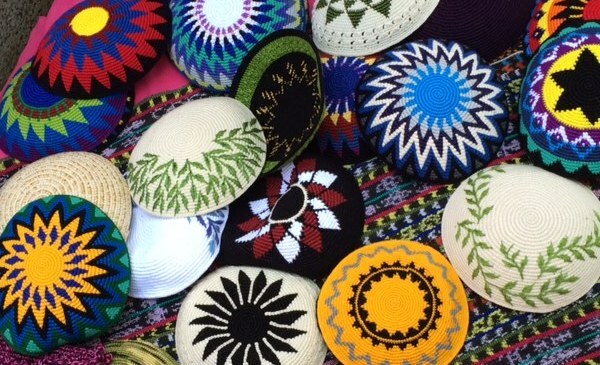 MayanHands, headed by Guatemalan-American anthropologist Brenda Rosenbaum, likewise sells beautiful challah covers, matzah covers, and kippot. One highlight was sharing our ideas with the artisans. We saw stacks of brightly colored square bread baskets made of gorgeous Guatemalan fabric in the famous Chichicastenango market. Hello, matzah holders! Look for them next year; the weavers are busy adding them to their Judaica offerings. Our ritual bread of affliction will be beautified by women’s economic empowerment. Betsy Teutsch is on the Advisory Board of Fair Trade Judaica, a Judaica designer, and the author of 100 Under $100: Tools for Empowering Global Women.